How Close Are You to Bicentennial? I'd suggest not buying more prisms. You would need to produce approximately 35 sextillion cookies with your 201st prism alone to be worth it. That is because selling the 201st prism would give you roughly 65 sextillion cookies and it costs you roughly 100 sextillion to buy.. I see, I'll keep them in the bank then, thanks. 484 hours into my 1.5Mil HC run and I finally got it!! I'll keep playing until I get at least a sept baked this game and 2 mil HC. This income boost is amazing! "I took things too fart." -KhantStopButtnugget. I am 10 prisms away from bicentennial which is gonna cost me around 500 Sx cookies. 13.4Qi baked all time. Yes. I stopped playing. Close. I'm needing roughly 270 sextillion more cookies, not counting current build-up in my Wrinklers which is like a day's worth and change. I'm getting roughly 10 sextillion more per day at baseline, plus more for each Elder Frenzy I hit. It should be 2-3 more weeks. My hope is that by that time the new updates will be out and I'll have extra incentive to hold off on resetting, so that I can take full advantage of it. Why? Is it so hard to run CC at background idling..
1 Prism to go! I'll get Bicentennial, Rise and Shine, and I am only 250 (give or take) sextillion from the Septillion-Until-Reset achievement. By then, I will only be 2 acheivements away from "winning" Cookie Clicker. Update! Just got "Rise and Shine", and "Bicentenial". I am coming close to the Septillion cookies achievement, and next I am going for Dr. T.
Stats as of Saturday, August 23, 2014. 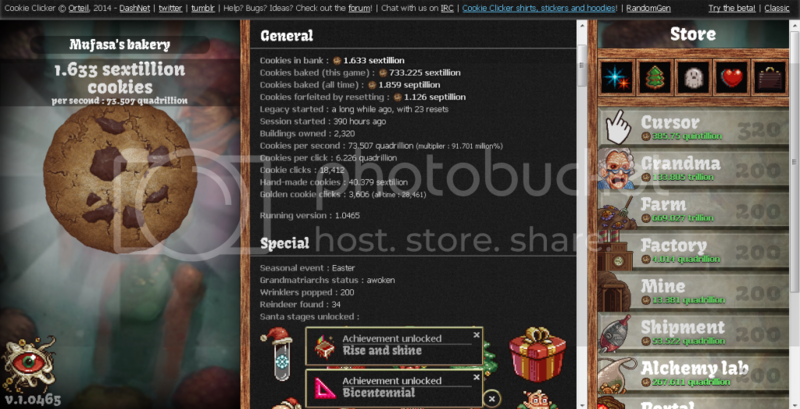 All time golden cookie clicks: 25,641. Cookies baked (all time): 15.15 septillion. I'm in the Septillion Club! I think it should be short because I spend much time on the PC and I can click many GC to accumulate as many "x666" on the Wrinklers (I have the window open in the bottom narrow enough to see the GC). But I have read it would be even faster if the Grandmapocalypse not reach the maximum. I'd have to try it, but I do not have the luck to take the most beneficial chain. Was it 1 sept baked all-time, or 1 sept baked in just that session? For the achievement, it has to be 1 sept baked in that session alone, not all-time. Did the number show as exactly 1 sept? I was thinking that if so and short numbers were on, then maybe the rounding of the displayed number might be to blame, perhaps making you think you had 1 sept, but the actual number might've been as low as 999.5 sext. Yes, it showed exactly 1 Sept. I'll be sure to get a little above a sept this time around. I'm at 500k HC only lol I was gone for too damn long. Still gonna be awhile til I make it there. I'm at 198 prisms. Finally it feels somewhat closer. Just bought 20 Prisms in one go after starting a Chocolate Egg bank with 180 of them a few weeks ago!